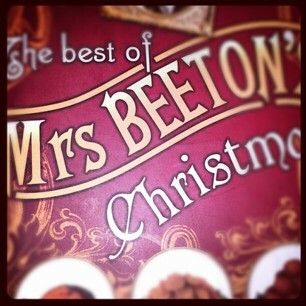 Mrs Beeton’s Christmas…No pressure then! This was a from my sister-in-law in a charity bookshop, to add to the collection of Mrs Beeton books…The week before christmas this a) makes me feel quite festive, which hasn’t happened previously, despite -or perhpas because of- battling the crowds on Friday to try and get all the presents, and b) makes me panic a tad about the stuff I have to get done…eeek! Also makes me think of the annual mince pie tastings we tend to engage in -every year we end of trying pretty much every brand going in an attempt to find the best…2012’s winner seems to be either M&S or Morrisons bakery version…what do you think?